Oil on canvas, 71 x 97,5 cm. As the first landscape painter of his generation, Egbert van Drielst depicted scenes from the isolated, uncultivated wilderness around the Dutch province of Drenthe. He painted a large number of picturesque scenes of small dirt roads and ramshackle houses in a typically lush natural landscape. He was also very accomplished at imitating the techniques of Jacob van Ruisdael and Meindert Hobbema, two of the greatest Dutch landscape painters of the 17th century. In this painting, the ‘primitive’ landscape and Dutch peasant culture are brought together in harmony. 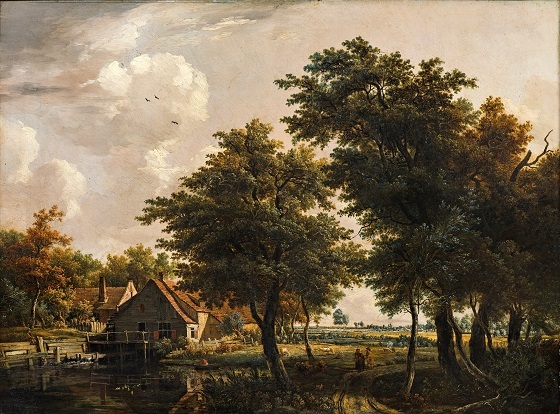 Even though large oak trees occupy a central position in the foreground of this scene, the water mill and fields on the horizon bear testament to humankind’s intrusion upon nature. The painting also features staffage; on a dirt road, a man has stopped to discuss something with a woman and her child, while a fisherman sits in a boat and another is standing by the bulwark of the mill pond.